Ok, I am having fits with the Piezo Buzzer included in the kit. What is the absolute simplest circuit that will make the stupid thing make a noise? I have been playing and getting all kinds of little projects work (with and without the MCU) but I have not had any luck with the buzzer. I must be missing something. The buzzer requires an AC signal. (or something close like a square wave). Try frequencies between 1000 to 4000 Hz. Thank you Mongo for the reply. It took me a bunch of searching at lunch today, but I think I have a solution. I will post what I find out tonight after testing. 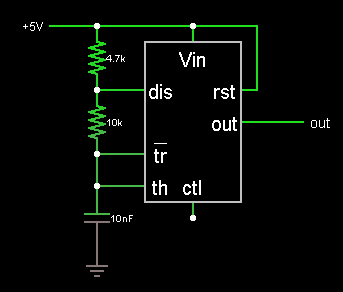 I got it working with a 555 timer, now it is time to figure it out with the MCU. It was a really high pitched tone, but I didn't really care, I just wanted the dumb thing to make noise. DDRC |= 1 << PC4;       // Configure pin PC4 for output. delay_ms(1);        // and wait 1ms. Thanks for the code. I used my tempsensor code and was able to put the config line at the beginning of main and just put the toggle pin line inside the for loop for the temperature samples and it worked! yeah, mission accomplished!